Oh how cute! Thanks for the great idea. Just the right size and sounds delicious. I can almost taste it with a hot cuppa tea! Your mini apple pies look adorable, Kitty! Johnson Brothers always has such pretty china patterns. Nothing better than a little pie, coffee and good company. Your mini apple pies look delicious and the perfect accompaniment to a cup of tea. Have a great week, Kitty! These are so adorable Kitty and I'm sure knowing your culinary skills they are yummy too! What a beautiful teacup to enjoy with the mini apple pies. They look just perfect! Glad you're enjoying cooler days. It's getting chillier here, long past eating outdoors unless bundled up! oh boy, how I would love a mini apple pie/cookie right now! These look so delicious. I feel like I need to make these right now! I like the idea of small pies for just one, or to share. I purchased a couple of 6 inch ceramic pie plates from Michael's to make smaller pies for hubby and I but haven't used them yet. The perfect teacup for your autumn apple theme Kitty. We had nice weather for our Thanksgiving and a good visit with family. Hello Sweet Kitty! Mmm apple pies! They are so cute and I could eat two of them! And your apple teacup is perfect for this time of year. PS I'm using a keyboard to help post with my iPad and I'm thrilled! Yummy! I love individual desserts and these look adorable. I'm sure the taste is heavenly! I must say though that I think you may have more patience than I do to make them. :) I love Pampered Chef products but I don't have the Cut 'n Seal. I love the tea cup and saucer. Glad you went to Savannah and Charleston when you did, Kitty. They got hit hard with Matthew. These pies are too cute and I bet delicious. Oh my goodness, those are so pretty and extra special because of their tiny size. I love them! These are so perfect for a tea party or any little Harvest party. I love them. Those pies look delicious! I just love that Johnson Brothers pattern...very similar to my Covent Garden...like your better! lol! And love the cottage ware teapot vase! Charming! Thanks so much for linking to Tuesday Cuppa Tea! What a darling little teapot...sooo special & sooo perfect for Autumn, too! It looks just like the thatched homes we saw in Ireland. I would love to nibble a tiny apple pie with my tea this morning. They look so cute! Anytime you make something & share it, Kitty, you make me want to start cooking too. You sure do have a nice collection of teacups! Oh Kitty, I bet your house smelled like a little bit of heaven! Your pies are just so cute, and yes yummy; I'm sure! Love your teacup! I have a set of four plates with that design that I found at a thrift. I plan on using them on my Thanksgiving table. Thank you for sharing your recipe with SYC. Those little pies are the cutest. I love mini pies, so I will give these a try! Kitty, I want one of those right this minute! I can't think of anything that sounds better to me at this moment. Yes - those mini pies are perfect for fall - or anytime really! Delicious. 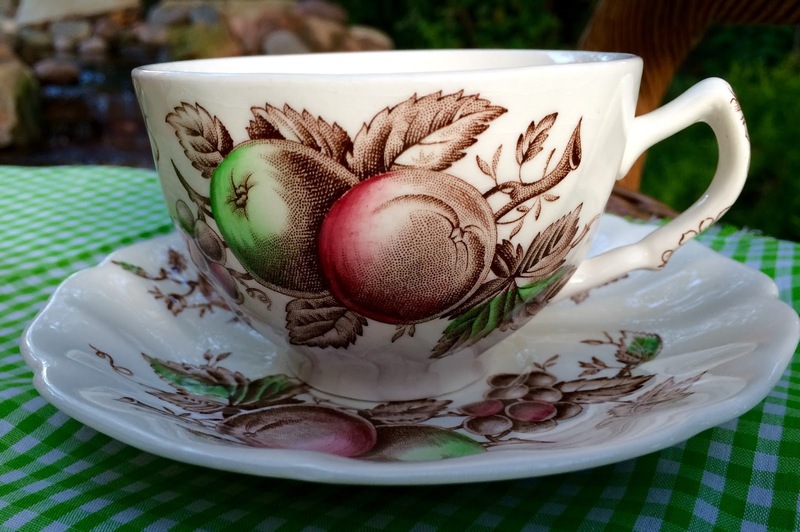 I love your Johnson Brothers tea cup as that pattern is wonderful and I am so glad you shared and linked your posting! Thanks so much for participating. What beautiful little pies! I love any mini dessert! Baking in the fall is so much fun! Your little pies look wonderful, Kitty! I haven't made mini apple pies in ages. They do make a lovely little dessert for after dinner or tea time. Love your cottage teapot too and JB teacups are always a delight to see. Enjoy your weekend, dear friend. What darling little pies Kitty! We have been having lots of apple crisp this year instead of pies. I need to try yours! I love your teacup and the cottage teapot with the pretty flowers! I don't have a cottage teapot, maybe I need to look for one! Have a wonderful week! Hi Kitty, sorry it took me so long to visit your blog this week. It's been such a busy week for me and I've been off the computer. I love your little apples pies. I will have to make them some time. These apple pies look delicious! I saw a similar recipe on FB and bought some apples but haven't had any time to make them. How nice to have tea outside in the fall! It was beautiful here though a bit chilly, 61 degrees! It's supposed to be back in high 70s midweek. Looking forward to that! Love your vintage teacup!! So pretty, reminds me of the teacup you gave to me with the fall flowers. I think of you every time I use it! Hope all is well! 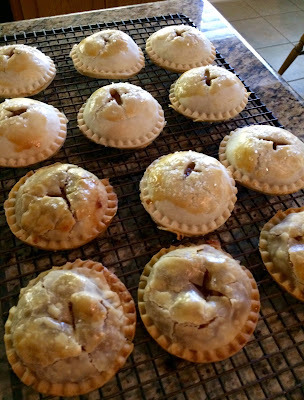 Thanks so much for sharing your awesome Apple Pies with us, Kitty! Have a great week and hope to see you at Full Plate Thursday again real soon! I love apple pie and yours look delicious. Thanks for sharing at Monday Social. Hi Kitty! 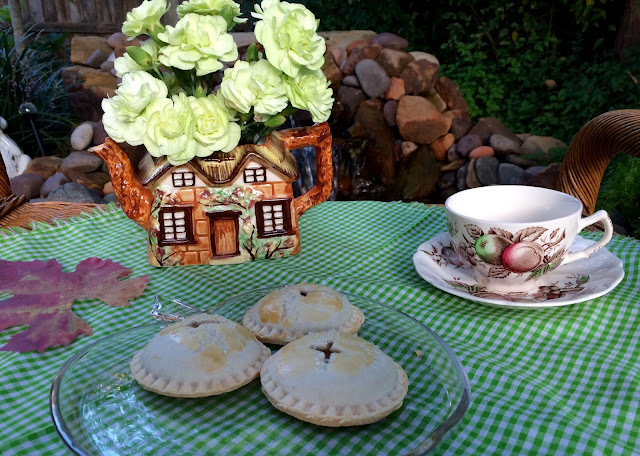 I'd love to come have mini pies and tea with you! :) They look fun and yummy! Apple pie and cherry pie are my favorites. Love the idea of mini-pies. Also, love Johnson Bros anything! Ha! Have a great week! Oh wow, Kitty, this is a great post! I love your gingham cloth, the darling cottage teapot, and those pies are so cute. I'm sure they smell, and taste, wonderful! :) I also adore that Johnson Brothers teacup and saucer. They made so many pretty patterns of dishes. Thanks for sharing the recipe with us and have a wonderful week!